A Interim Group Management Report 5 Executive Summary 12 Property-Casualty Insurance Operations 22 Life/Health Insurance Operations 28 Asset Management 32 Corporate and Other 35 Outlook 37 Balance Sheet Review 44 Reconciliations Interim Report Third Quarter and First Nine Months of 2014 Allianz Group 19 % Combined ratio Loss ratio Expense ratio three months ended 30 September 2014 2013 2014 2013 2014 2013 Germany2 90.3 105.2 64.6 78.4 25.7 26.8 Switzerland 90.2 88.1 67.1 63.8 23.1 24.3 Austria 95.8 95.6 72.9 71.8 22.9 23.8 German Speaking Countries2 90.7 102.2 65.6 75.9 25.1 26.2 Italy3 78.4 71.5 52.2 48.3 26.2 23.2 France 92.1 99.5 64.6 69.8 27.5 29.8 Benelux4 96.0 97.4 65.2 67.5 30.8 29.8 Turkey5 95.8 90.5 73.3 67.6 22.5 22.9 Greece 89.9 77.4 53.1 47.6 36.8 29.8 Africa 93.3 105.3 52.2 62.0 41.1 43.3 Western & Southern Europe6 87.5 87.1 60.5 60.6 27.1 26.6 Latin America 113.2 97.9 81.4 66.7 31.8 31.2 Spain 88.8 91.5 67.4 70.7 21.4 20.8 Portugal 96.7 95.6 74.0 71.8 22.7 23.8 Iberia & Latin America 100.3 94.6 74.1 69.0 26.1 25.6 United States 136.5 103.5 107.5 73.7 29.1 29.8 USA 136.5 103.5 107.5 73.7 29.1 29.8 ­­Allianz Global Corporate & Specialty 89.7 88.1 62.7 63.0 27.0 25.2 Reinsurance PC 90.1 104.1 61.1 75.5 29.0 28.6 Australia 96.8 91.0 72.3 66.6 24.5 24.4 United Kingdom 94.7 95.5 63.8 64.5 30.8 31.0 Credit Insurance 80.1 81.8 51.0 52.8 29.1 29.0 Ireland 94.6 92.5 66.4 61.9 28.1 30.6 Global Insurance Lines & Anglo Markets7 91.0 93.5 62.9 65.9 28.1 27.6 Russia 121.0 106.0 80.6 66.7 40.4 39.4 Poland 99.6 99.4 65.2 65.4 34.4 34.0 Hungary 102.4 94.4 63.9 57.7 38.5 36.7 Slovakia 88.0 82.4 53.7 50.7 34.3 31.8 Czech Republic 86.2 62.5 60.8 37.8 25.5 24.7 Romania 99.5 103.1 69.4 74.6 30.1 28.5 Bulgaria 140.0 75.1 116.5 51.4 23.5 23.7 Croatia 104.5 89.7 66.9 52.7 37.5 37.0 Ukraine 87.4 100.0 56.2 44.2 31.2 55.8 Central and Eastern Europe8 104.6 93.6 69.5 59.4 35.1 34.3 Asia-Pacific 93.6 92.2 63.3 61.3 30.3 30.8 Middle East and North Africa 95.1 95.3 60.3 59.7 34.8 35.6 Growth Markets 102.4 93.4 68.2 59.7 34.2 33.7 ­Allianz Global Assistance 96.5 95.6 63.5 60.5 33.0 35.1 ­Allianz Worldwide Care 90.3 93.1 70.9 73.9 19.4 19.2 Allianz Worldwide Partners9 97.1 97.0 65.3 63.5 31.8 33.5 Consolidation and Other10,11 – – – – – – Total 93.5 94.8 65.9 67.2 27.6 27.6  8 Contains income and expense items from a management holding and consolidations between countries in this region. 9 The reportable segment ­Allianz Worldwide Partners includes the business of ­Allianz Global Assistance and ­Allianz Worldwide Care as well as the reinsurance business of ­Allianz Global Automotive and income and expenses of a management holding. The set-up of this division will be further enhanced during 2014 with the reclassification of our International Health business in France from Life/Health to the Property- Casualty business segment retrospectively as of January 2014. The reinsurance business of ­Allianz Global Automotive contributed with gross premiums written of € 15 mn, premiums earned (net) of € 15 mn and an operating loss of € 3 mn for 2014 and with gross premiums written of € 14 mn, premiums earned (net) of € 8 mn and an operating loss of € 10 mn for 2013. 10 Represents elimination of transactions between ­Allianz Group companies in different geographic regions. 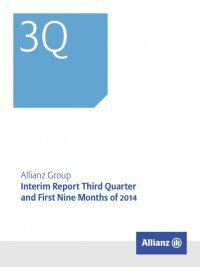 11 The 2014 analysis of the ­Allianz Group’s asbestos risks resulted in a reduction of reserves and a positive run-off result of € 86 mn reflected in the operating profit for 2014.